This is a better view of the three big trees that fell during the first wind storm. The rain eroded the base surrounding the root ball. Three trees had grown in a clump and when one got forced over, they all got forced over. The height of the root ball from ground to sky is about fifteen feet and there's a five-foot deep pit where the root hand once rested. 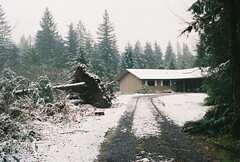 The biggest of the three trees, a hemlock, is over three feet in diameter. the other two, a pine and a cedar, are only about a foot and a half in diameter each. Still, the trees were our shade in the summer and they were perches for Pileated Woodpeckers. You can see how close the tree is to our house and we were fortunate that the winds were from the south instead of the north.